Whether we live in the country, city or suburbia, there's nothing to compare with a comfy, well-worn-in pair of boots! I'm afraid I don't have anything clever to say about this card - I just like the image and it's fun to colour! This is my first spring card - it was so easy that I just don't know why I haven't made one long before this! There's a great tutorial at Splitcoaststampers. I used Delightful Dijon, Basic Black and Whisper White cardstock. The greeting is from Birthday Banners and I used the 3D banner from the Cupcake Cutouts framelits. 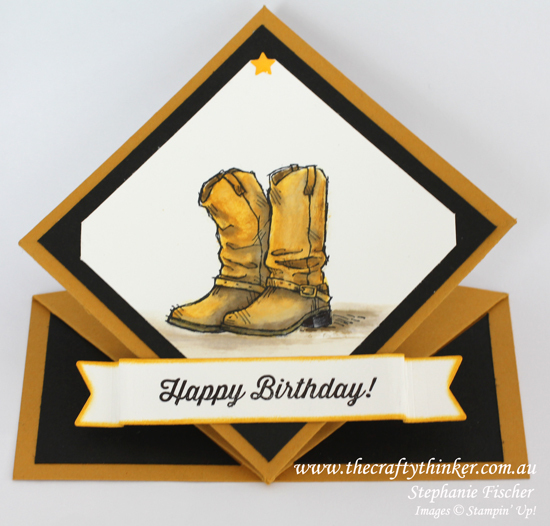 The image of the boots is from the Country Livin' stamp set. 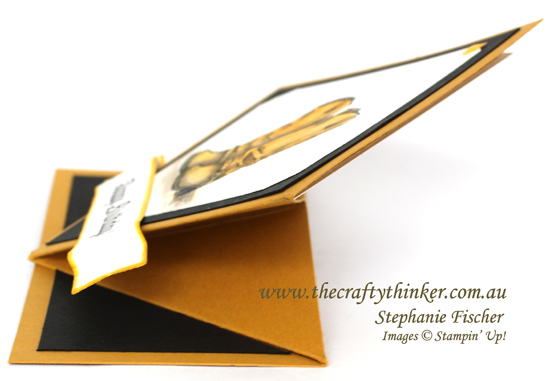 I added a Crushed Curry Enamel Shape (from the Regals pack) to the top of the card. I've cut myself a piece of Whisper White cardstock , ready to write my message, but I haven't adhered it yet - I'll do that after I've written.